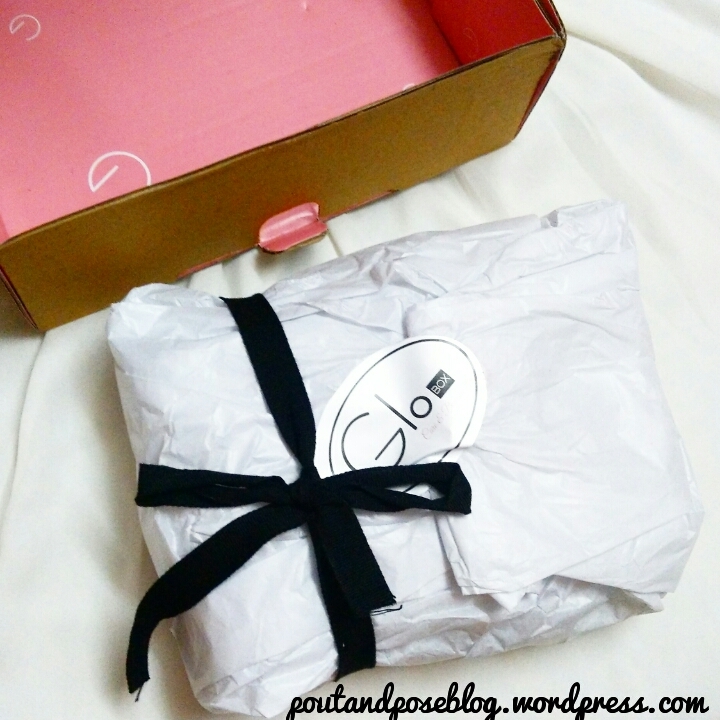 Today i am introducing you guys to an all new Beauty Subscription Box called Glo BOX . Well i know you might be familiar with beauty subscription boxes but Glo BOX is something unique and created keeping in mind the needs of customer. Unlike other subscription boxes its not a random beauty box where you get random beauty products. 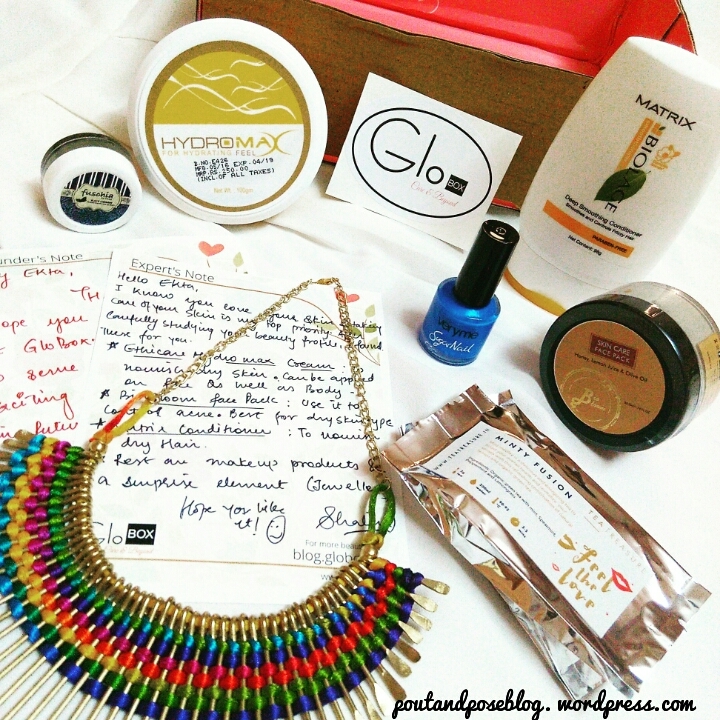 Glo BOX is a personalised Beauty Subscription Box…. PERSONALISED I’ll say it again…which contains beauty products carefully selected by beauty experts to suit your skin needs and hair type concerns, delivered at your door step each month. Its like a mystery box because you never know what you are going to receive. 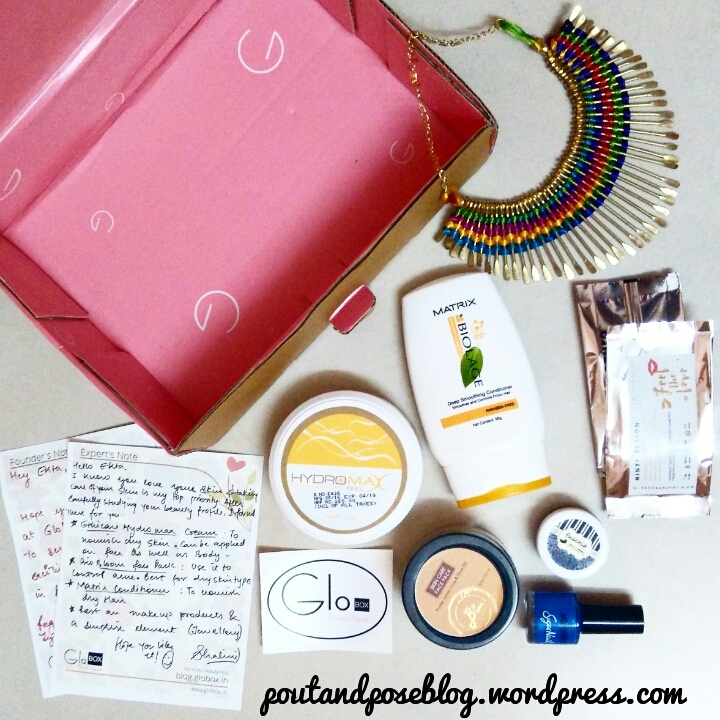 Globox does not guarantee any specific product to be present in any month’s Beauty Box .This means every box will contain different products as per the customers beauty profile. No products will be repeated in any future boxes. Glo BOX aims to combine the customer’s wishes with expert’s advice and bring the combination of right products to them every month. This mystery box will let you try more brands and help you find the right product. 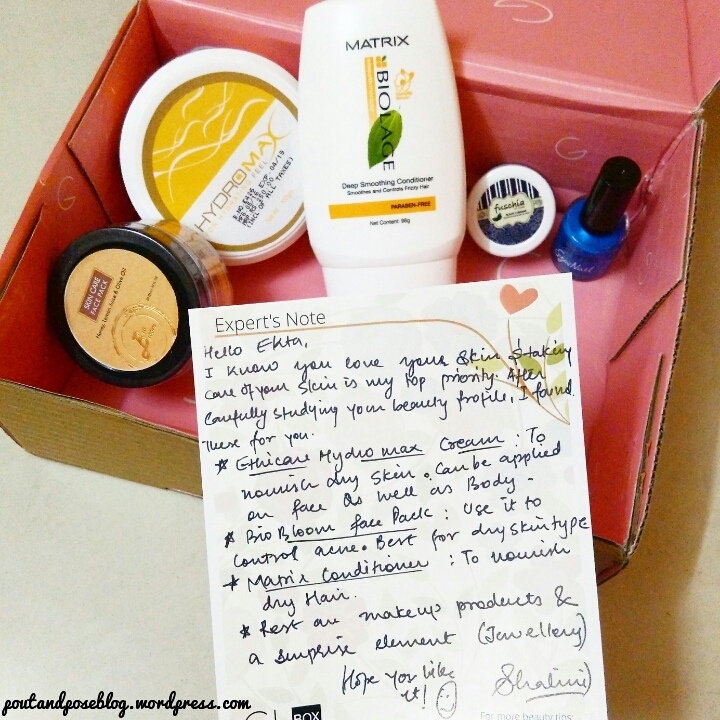 The box will contain 4-6 beauty products from all over the world selected by beauty experts as per your beauty profile. The products are all full sized. Surprise jewellery in selected boxes. It will also contain a Experts note in which they tell you why a particular product has been choosen and included in your box. The value of the box is far less than the total value of all the products inside the box. 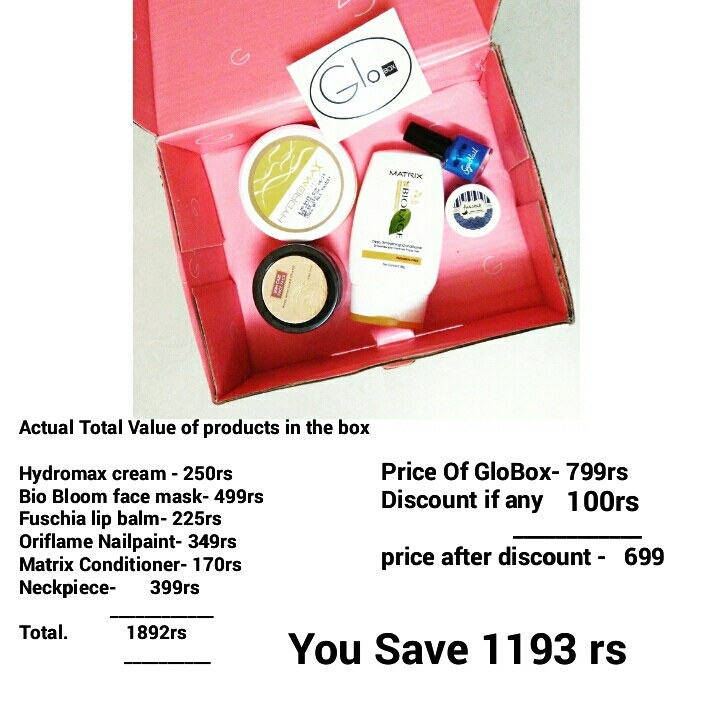 For eg- I got the monthly box priced at 799 and after discount at 699rs. It contained products worth 1892rs. Thus i saved 1193rs. How cool is that 🙂 yaaaayy. 3- Go to your cart and checkout and fill up your billing address details and make the payment.And you are done. Note- They have COD and PAY U payment option. Note– They currently have INR 100 OFF on the monthly box and the coupon code is “IN100” and 10% OFF on 3,6 & yearly subscription, Coupon code = “GLO10”. 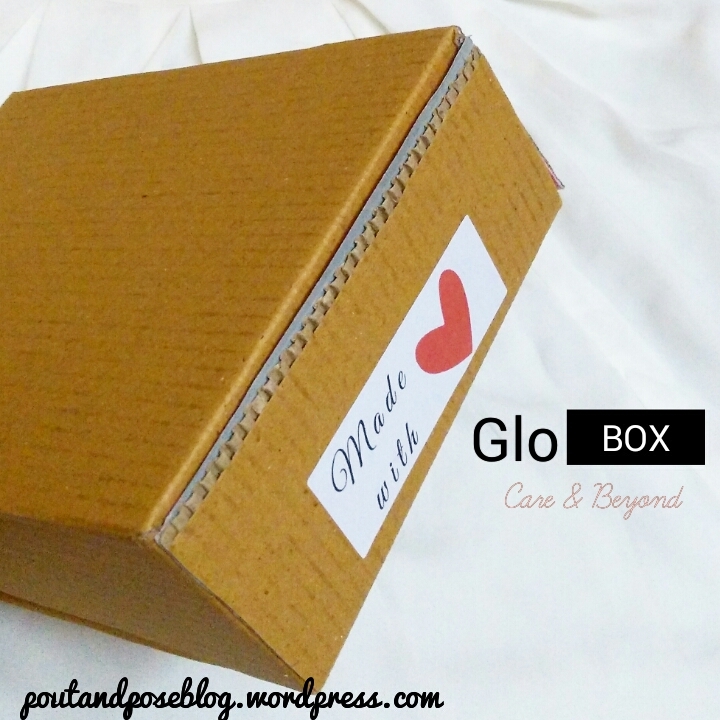 Contest Alert – Guys did you wonder why the Glo BOX is brown from outside?? Well Glo BOX team is running a ‘ Save the Brown Box’ contest. Besides this they also have amazing Limited edition themed boxes which are pre curated. ● For the month of August they have a ‘Rakhi gift box’ which serves as a perfect gift for a sister. And ‘The 1947’ box to celebrate the Independence day, this box contains products worth Rs.1947. Both of these boxes are priced at Rs. 999. Wow ..its really awsome and very much attractive. It’s nice to get handwritten letters from beauty experts. Will definitely try this subscription box. Loved reading your post. Yes totally 🙂 Do subscribe to it. I love trying subscription boxes. Glo box sounds interesting. Will try it out soon. Thanks for sharing about it.